I just thought I'd share a few photos from my phone that I have taken whilst out and about. They're of things that aren't particularly significant, but which made me smile a little. They're also not very clear because I, being the dolt I am, totally forgot to check the resolution settings on my phone's camera before taking the photos. So you'll just have to take my word for it on the detail. Yes, fashion has certainly gone backwards. Again. I don't mind when it goes backwards to the fifities or the sixties or even the seventies, but anything from the mid eighties to the mid nineties (let's call them The Uglies) is just awful. Then, in the mid nineties, fashion realised that they'd had it right in the 60's and brought back bootleg and flare jeans. Things were okay for a while, but then, a year or two ago, things went a little bit Uglies again. Boo. Note: Apparently this Kylie dress is from a 2010 video clip, and not from the Uglies at all. For SHAME, Ms Minogue! Anyway, enough about that photo. Coming in second place is my local Centrelink. 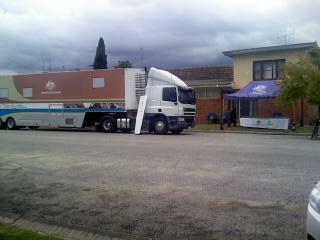 Oh yes, Barham's Centrelink is a tent and a semi trailer and a couple of camp chairs. Really nice camp chairs, by the way. That's how we roll in the country. Soz about the image quality. As I said before, I didn't adjust my phone. This will become even more apparent in my number one next picture, because you're just going to have to take my word for what the sign in the window says. To give you a little bit of context, this was taken at a boat shop on (Old?) Port Road, near where Grant and I live in Adelaide. 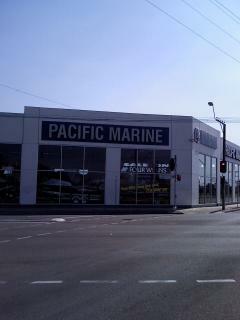 It doesn't seem to have any small marine craft in it at all - they're all fairly swish affairs. I suppose if you're going to mortgage your house for a boat, you may as well mortgage the whole damned thing! The sign says "Your wife just called - SHE SAID IT'S OKAY!!!" Gold star for ingenuity, boys. I reckon they'll make a few sales from men who take exception to the implication that their wives control the finances and want to prove themselves somehow. They'll also make a few sales from men who are perfectly okay with the fact that their wife controls the finances, who told their wife about the sign and she thought it was just as funny as I did. I'm trying to decide which is worse - whether they unknowingly created that dress looking like it had boobies, or knowingly did it and thought it was class.